I just have to shout a WOOHOO. If you would, please take a look up at your address bar above. Go on, I'll wait. . .
Do you see it? It no longer says CraftyHope.BLOGSPOT.com. My blog is now simply CraftyHope.com!! We've owned the url for a while now and just used it on my Tumblr because they had free hosting. Well, while I was at the blogger's conference on Tuesday, Debbie of Flower Child Designs mentioned that she has a Blogger blog and only pays a minimal amount to have her own URL on it. With further research, I realized that I too could have Blogger direct my blog to the url that I already own. WHAT!? I was able to do this by going to the basic settings page for my blog and adjusting the publishing option. See the 'edit' button circled above? I clicked it and found complete instructions for changing my blog address. It did involve going into the site where we pay for the URL and filling in some info, but Google (Blogger) provided that info. I will admit that Pat helped me with it as I already had a headache, and he's much better with tech speak than I am. However, it was an extremely easier process than I had anticipated. Now, let me apologize for the hokey welcome sign above, but I wanted to work in the little flowers as those are now my favicon. What's a favicon you ask? According to Google, it's "an icon associated with a URL that is variously displayed, as in a browser's address bar or next to the site name in a bookmark list." I circled all the favicons in my open browser. At the far right is mine. It's hard to see because favicons are only 16 pixels by 16 pixels, but here's what it looks like enlarged. Yup, it's a cute daisy I created in Photoshop and added to the favicon option in Blogger. 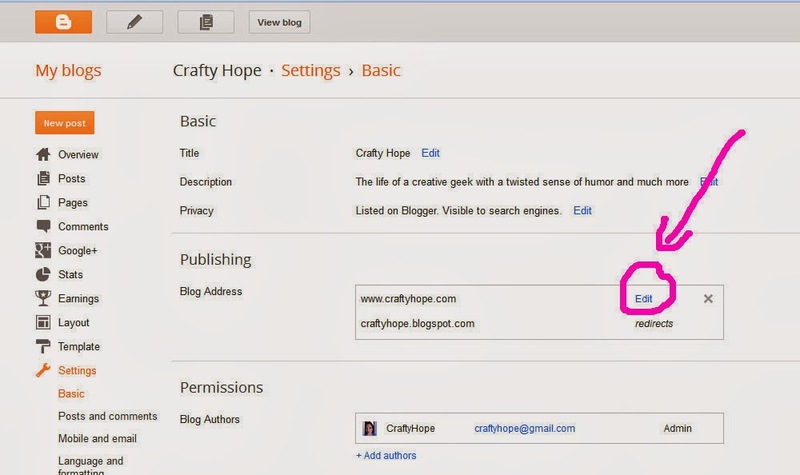 You'll find that option at the top of the layout page of blogger. Basically, you just upload a small image there and it becomes your favicon. Since you have such an EXTREMELY SMALL area, you'll want to use a pretty basic image. I've got some other changes I want to make on the blog, but Blogger's not cooperating right now. I think I might have given it whiplash or something. Oh well, tomorrow's another day and predicted to be a rainy one at that. I might get even more accomplished. Here's hoping. !!!!!!!!!!!!!!!!!!!!!!!!!!!!!! With the help of my computer techie daughter, I now have clam shell favicons on both my blogs!!!!!! Thank you Hope!!! Not sure about changing the domain yet though. Interesting and educational post, thank you for sharing this information. Cheers to you and your new URL craftyhope.com! How exciting to see our little blogger conference being helpful! That was the goal. Love your favicon and congrats on the url.